Hi everybody! I’ve been having a lovely time staying home with Henry- he is nice and very very fat. We sit outside in the mornings, and have been able to start going for walks now that the temperature has dropped out of the 100 degree + range. During Henry’s naps (he’s still sleeping on/next to me for every nap ), I spend my time reading food blogs and looking for dinner ideas on my magic phone. It occurred to me that, with minimal effort on my part, I could snap a picture of the dinners I make during the week, post a link to the recipe, and tell you my overall impression of them. And then you might get some dinner ideas from me! So this post will cover what we ate for dinner this past week, and hopefully I’ll keep this up in future weeks. Only time will tell! 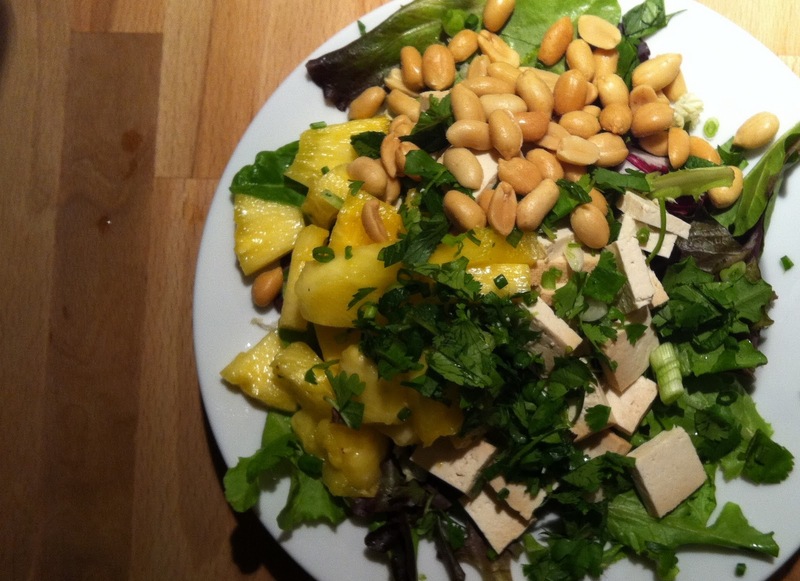 The salad you see at the top of this post is Pineapple, Greens, and Tofu with Roasted Chile Coconut Dressing. It was outstanding! And vegan! Andy was predisposed to hate this salad, and thought it was fantastic. It’s also surprisingly filling. Instead of straight old boring tofu, I made tofu cheese, which sounds horrifying but is really great- this technique gives the tofu great texture and a subtle miso flavor- s’nice! One other note- the dressing recipe yields more than one-and-a-half cups of dressing. We used less than a tenth of it, I’d say. The next time I make this, I’ll scale that way down. My sister and I had a girl’s night and watched Bridesmaids! Naturally, we also ate a lot of cheese. 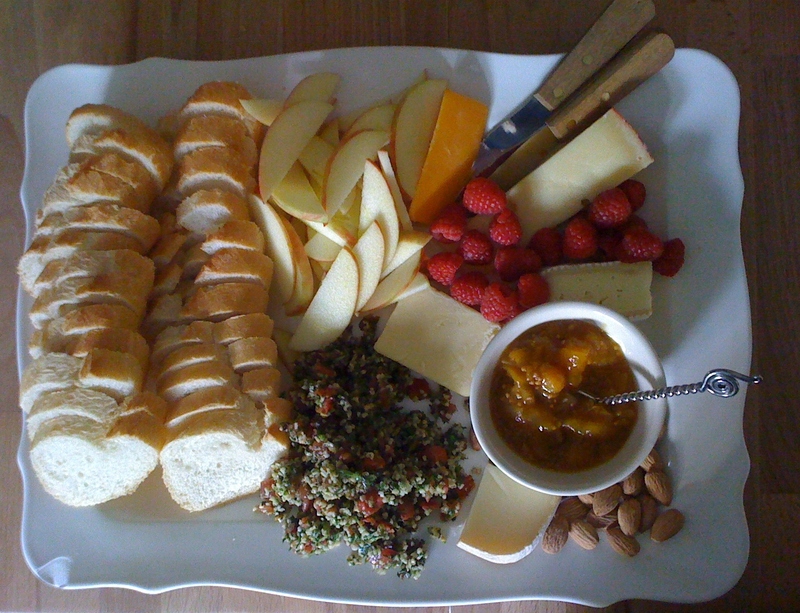 We had a collection of cheeses from the $3 or less cheese-bits drawer at Whole Foods, plus tabbouleh, raspberries, honeycrisp apples, almonds, and some of our friend Abbie‘s delicious peach/mango chutney! With the temperature dipping into the 80s this week, I took that to be as good a sign as any to start making cool-weather foods. This was one of my favorites from last winter- Smothered Cabbage Risotto. It’s not glamorous, but it’s completely wonderful. 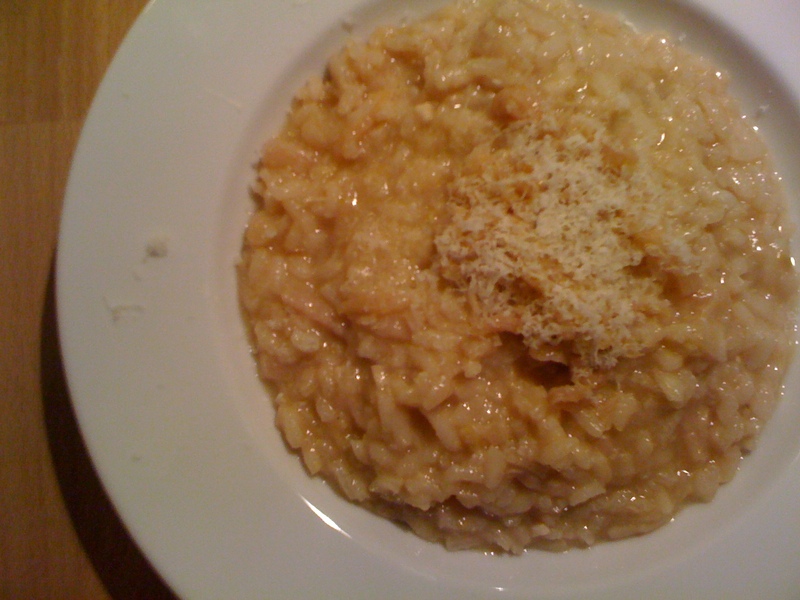 Also, if you like science-y food articles, this one offers a really easy risotto cooking technique. 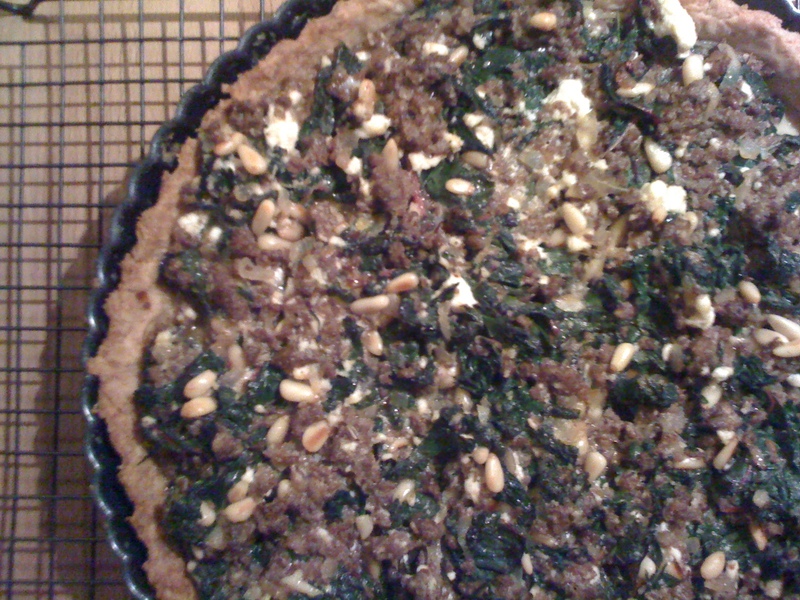 This is a Sausage and Kale Tart, the winner of “Your Best Dirt Cheap Dinner”, a recent food52 contest. Though I wouldn’t describe it as dirt cheap (sausage + wine + ricotta), it was tasty! I replaced the crust with my favorite partial whole-wheat one, and used two bunches of chard instead of kale. 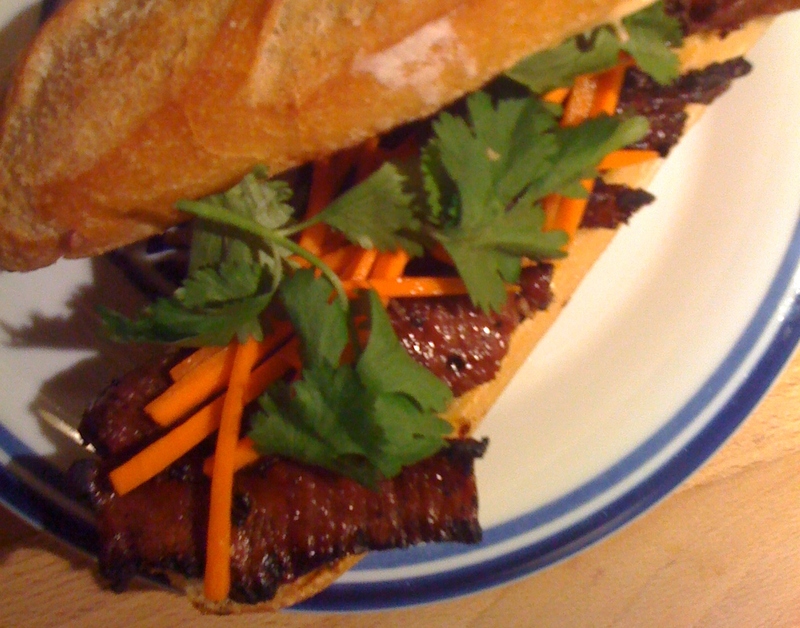 Steak Banh Mi! Not at all authentic, but a pretty easy and totally delicious weeknight version. This was Andy’s favorite dinner this week, and I loved it too. Especially with a baguette from Baguette et Chocolat, which sells the best baguettes and batards (and pain au chocolat!) in Austin, which you can buy from their shop or from the farmers’ market at the Burger Center. Last but not least, Wednesday was my darling sister‘s birthday and she requested a strawberry cake with cream cheese frosting. I didn’t want to resort to using a cake mix, so I was ecstatic when a reliably awesome food blogger posted this recipe. It turned out beautifully, and was moist and lovely and not too sweet. 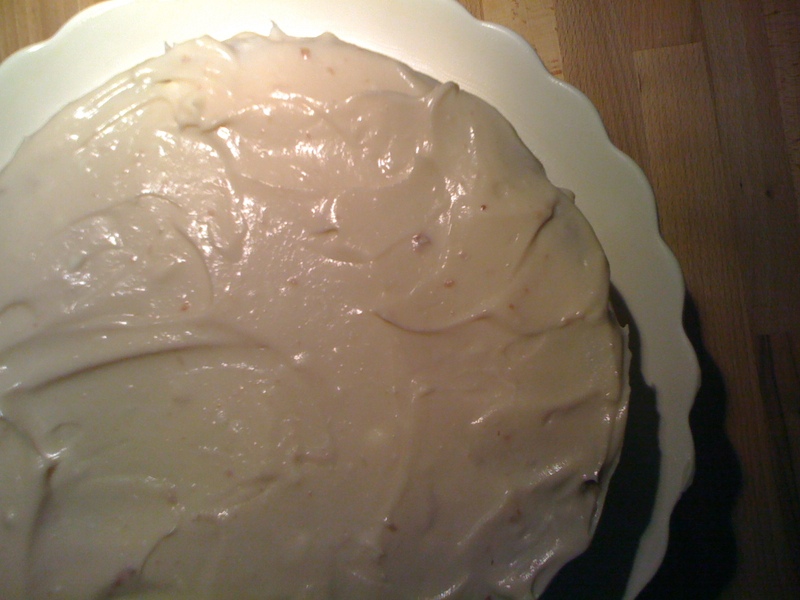 The cream cheese frosting was also perfect, with a little bit of strawberry jam mixed in. The recipe calls for 10 oz of cake flour, or 2.5 cups- I weighed out 10 oz of flour on my new kitchen scale, and then measured it just for fun, and it yielded only 2 cups, so that’s crazy. Ok, that’s all! Stay tuned next week for smoked sausage kolaches, creamy tomato soup, and roasted chicken with apple panzanella, among others! Next Article Food52 Potluck with Amanda Hesser!